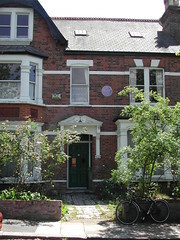 Founder of the first voluntary blood donor service, lived and worked here. PL Oliver is due more widespread recognition than he gets. 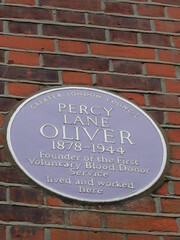 He is responsible for starting the first blood donor service at Kings College Hospital in 1922. Thereafter, with the help of Geoffrey Keynes, a surgeon and brother of the famous economist, he established a London wide blood donor panel which was in existence at St Bartholomew’s |Hospital until 1987. Percy Lane Oliver was my great grandfather! True! Percy Lane Oliver was my Great Uncle. His brother Douglas Oliver is my Grandfather and Melinda is my Daughter. As far as I know my son Paul Oliver is the sole remaining relative to carry on this branch of the Oliver lineage anmd to date he only has a Daughter. Our grandmother was Doris Oliver, nee Dufty, who was married to Edward Oliver and had one child, Sylvia ‘Judy’ – our mother. Its nice to hear from other relations. What I found strange was that no one in our part of the Oliver family ever spoke about the work Percy did and I only found about him after my mother and father were dead. I have some of our family tree but only as far back as Edward Oliver who died in 1837 in Fareham. I did not know your grandmothers name, only that they had a daughter Sylvia. Hve you got the dates of birth and death of Doris Duffy, the death of your mother and you and vivians birthdays. Hve you done any research into your family tree? Percy Lane Oliver is my Great Uncle. I have details of the family tree: Paul Curnow, who was Percy’s grandfather, was my great, great grandfather. I have addressed envelopes to Paul Curnow at the lighthouse Cromer. Percy was my great grandfather and I was brought up at 5 Colyton Road. Percy’s wife Ethel died in 1973 and I have fond memories of her (I was 13 when she died). My grandmother Marjorie Oliver (born 1910) was one of three children – the others were Edward (born 1908) and John (1915-1918). Marjorie married Charles Hardy and had three children – Helen (born 1931), Ann (1933-34) and Marion (born 1935). Helen and Marion lived at Colyton Road until 3 or 4 years ago when they moved out to a more manageable flat in Forest Hill (about one mile away). Marion is my mother and I have one brother Paul (born 1956). I now live in Edinburgh with my wife Jane and our 4 children. As well as the blue plaque at Colyton Road, Percy has a memorial plaque in St Ives which is where his grandfather Paul Curnow (1819-1913) was a blacksmith. Paul was also a distinguished coxswain of the St Ives lifeboat receiving two RNLI medals – there are photographs of him in the lifeboat house. Before Marjorie died she drew up a family tree which includes many of you ! It has been quite a shock to find this discussion through an almost random google search about Percy. Having just watched Ian Hislop’s TV series on the British Do -gooders, it would be very interesting to cover my Great Uncle’s history in such a programme. It is clear that Percy Lanes Oliver did not achieve the recognition he deserved. It is also sad to learn that the blood donor service is being disbanded because of new technology. Perhaps this is a good opportunity to look more closely at the good works that Percy was involved with. Percy “Lane” Oliver was my great uncle too. His sister Ethel was my grandmother. I have researched the Oliver family since 1973. As a result of my long interest in the family I have several items relating to Percy including a collection of newspaper cuttings about him and a photograph of him receiving his OBE. He added the middle name “Lane” himself some time after the death of his father, Edward Lane Oliver. Percy’s father, Edward Lane Oliver, who died in 1902, was the son of Edward Oliver and Susanna nee Lane. Edward Lane Oliver married Jane Hosking Curnow in 1875. Percy was their second son and was born in St Ives registered as Percy Oliver. He was still named Percy Oliver on his marriage certificate of 29th July 1905 so he must have added the Lane as his middle name later than that. I am Rosi’s sister and Percy Lane Oliver was My Great Uncle too..His sister my Grandmother took me to London and I stayed with Great Aunt Ethel (who I adored) when I was 12.I came back for several years. (I live in London now).Helen and Marion became friends.I recall my times at Colyton road as very very happy ones.I became a Sister/matron in NHS and when coming back to London applied for a job which incredibly was where Percy and Ethel worked facing Peckham Rye Park. I saw the photograph and plaque in the entrance to the Stennack surgery in St Ives and thought Percy bore some resemblance to my grandfather, William Thompson Oliver ( also an O.B.E). Has anyone researching Percy’s ancestry found a link with the Olivers of Otley, Yorkshire? Hi, I know this thread is quite old, I am also related to all of you by the sounds of it, but not sure how. My father and grandfather are both Stanley Oliver’s and I believe I may be Percy’s great grandson or great gran nephew. I certainly know Sylvia, if any one picks up this post I would really love to know more! Thank you Robert Oliver! Sorry for the slow reply, I think we may possibly be related or it may be a coincidence. My father Stanley Oliver had a cousin who was a Sylvia she was the sister of my grandmother Winifred Oliver nee Bush? The family said we were related to Percy Lane oliver and we know they came from Cornwall, just seems tricky to find the link!